Other Products by Muscle Pharm. Search other Protein Powder products. 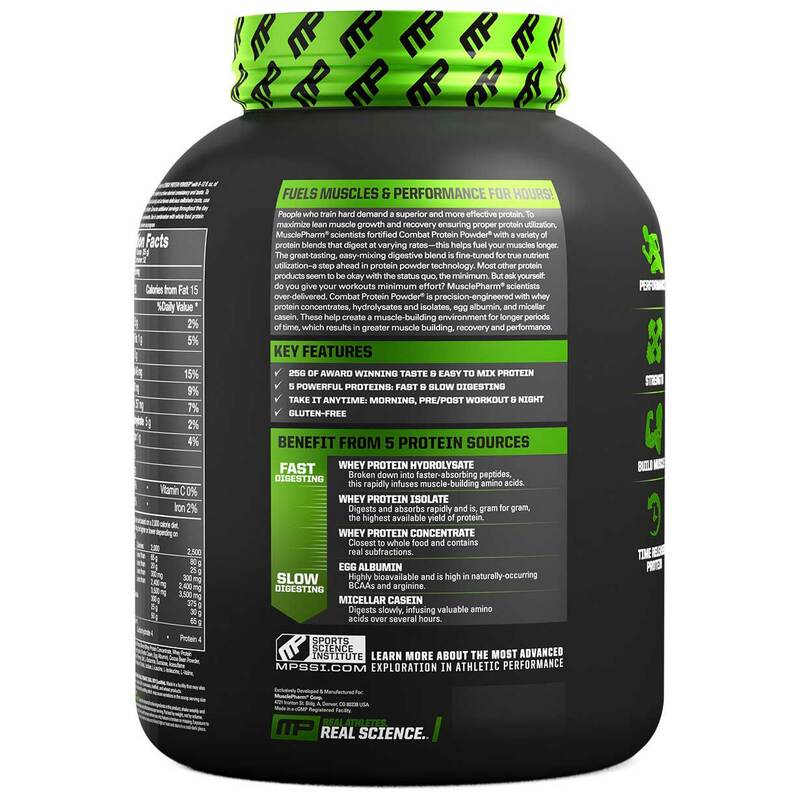 MusclePharm Combat Powder is a technologically advanced Protein Superfood. Athletes and Bodybuilders have long known that high-quality protein is the key to building and maintaining lean muscle, while supporting a healthy body composition and fueling fat loss. Protein is the most-important macronutrient for muscle growth, mass and power. High quality protein supports muscle growth and recovery and the integrity and health of all body tissues. Active bodies require MORE high quality protein for optimal performance - MUSCLEPHARM COMBAT was designed to answer that need. MusclePharm Combat Powder delivers 25 grams of the highest quality PROTEIN BLEND, in a great tasting, easily mixing shake. COMBAT was formulated specifically for athletes and active individuals to support their bodies' increased protein demands. Muscle Pharm Combat Powder was carefully formulated using 5 specific proteins, each chosen for their high quality and for their distinct properties. The key protein components in COMBAT are precisely combined to cover all the necessary amino acids for optimal growth and recovery, with extra Branched Chain Amino Acids and extra Glutamine to provide maximal growth, recovery and repair. The staggered absorption rate of the 5 different protein components in COMBAT guarantees a complete 8-hour nutrient infusion. COMBAT is a superior combination of the best protein sources available, combined to keep a steady flow of muscle and power building nutrition flowing into the bloodstream, over up to a full 8 hours! What's In Muslce Pharm Combat? Whey Protein Isolate - Highest available yield of protein, gram for gram, of any whey protein source, WPI is fast absorbing into the muscle tissues, and has immune boosting properties to protect the body system during periods of intense training. Partially Hydrolyzed Whey Protein - Hydrolyzed whey is protein that's been broken down into fast-absorbing peptides. The fastest absorbing of all forms of whey, hydrolyzed whey hits the bloodstream first, providing a rapid infusion of muscle building amino acids. Micellar Casein - very slow-digesting, micellar casein has the capability of slowly infusing amino acids over several hours, protecting muscle tissue from breakdown over time. There is no substitute for the anti-catabolic effects of micellar casein. Whey Protein Concentrate - closer to the whole food sources than other whey proteins, concentrate contains real food subfractions such as alpha-lactoglobulins and lactoferrins, with specific immune boosting and muscle building properties. Egg Albumin - High bio-availability and well tolerated by most individuals, egg albumin has a high BCAA content and arginine. Egg albumin is a powerful contributor to hormone production and the muscle building process. Digestive Enzyme Blend - Digestive enzymes break down food along the digestive tract so that nutrients can be absorbed into the bloodstream. COMBAT contains 60mg of a Digestive Enzyme Blend to aid in the digestion and absorption of the key muscle-building proteins contained herein. The body cannot absorb what it cannot break down. The added Digestive Enzyme Blend ensures maximum utilization of COMBAT's muscle-building protein component. Added BCAAs and Glutamine - The Branched Chain Amino Acids, L-Leucine, L-Isoleucine, and L-Valine, are the most critical of the essential amino acids for the maintenance, repair and building of muscle tissue. The BCAA's (especially L-Leucine) have been shown to stimulate protein synthesis and therefore, muscle growth. BCAA's may also slow down catabolism by inhibiting cortisol. L-Glutamine is the amino acid that has immune-boosting properties. L-Glutamine helps with recovery as well. Together, the extra Branched Chain Amino Acids and the added Glutamine in COMBAT fortify the muscle-building, recovery and immune-boosting properties of this, the most technologically advanced protein super food available. COMBAT feeds the anabolic and recovery pathways within the body to support muscle growth, fuel recovery and maximize the body's adaptive response to hard training. With a precision-engineered matrix that contains whey protein concentrates, hydrolysates, and isolates, as well as egg albumin and micellar casein, COMBAT is the ultimate timed-released protein super-food! Because each of the distinct protein sources found within COMBAT digest at varying rates, amino acids are not only flooded into the bloodstream within minutes after consumption, but will continuously be "trickle fed" to your muscles for up to 8 hours afterward! When is the best time to use Combat? Certainly the most important times are immediately upon awakening, right after training, and just before bed, as these are vital periods for the initiation of the growth process. However, Combat can also be used at ANY time of day as a substitute for whole food protein. Why not use just whey protein? Isn't that the best source of protein? While whey is one of the most important protein sources on the planet, it has its limitations, and thus works best as part of a blend of proteins. You see whey protein is digested very quickly, which causes a rapid rise in blood amino acids. While this seems like a great thing, there remains a problem. These amino acids are cleared from the system almost immediately, which is excellent for the short term, but does not cover the period of time between meals. However, with the addition of egg albumin and micellar casein you will slowly trickle feed amino acids to your cells over a period of up to 8 hours! This makes COMBAT the ultimate anabolic and anticatabolic protein matrix! Will COMBAT mess up my stomach? Many protein powders do? 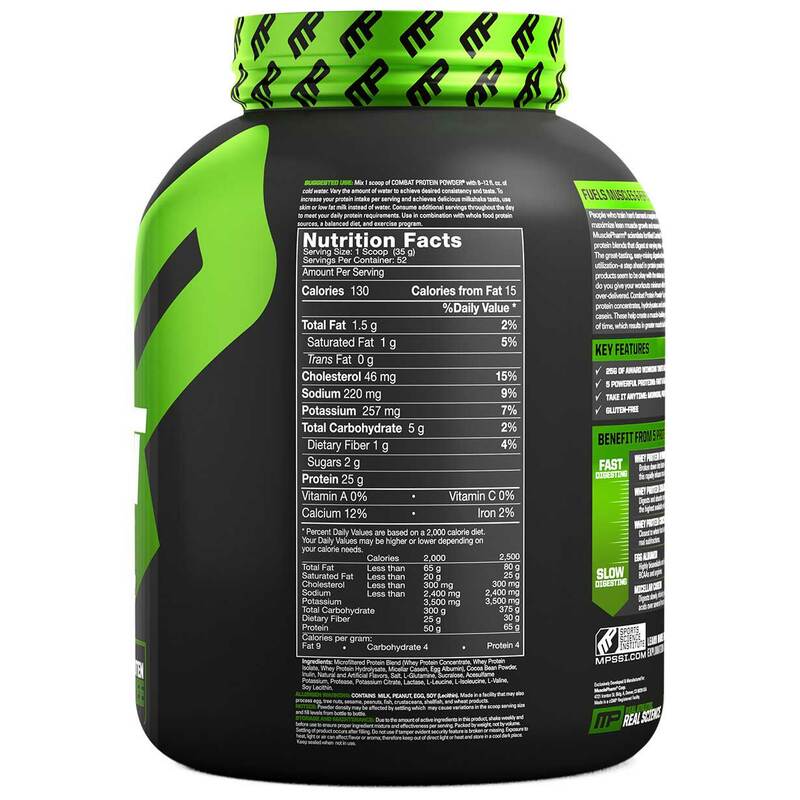 Muscle Pharm Combat contains some of the best, and purest proteins currently available and is very low in lactose. Additionally, a special digestive blend has been added to the formula to promote better digestion and assimilation of the protein constituents. For most, COMBAT provides no stomach discomfort whatsoever. What really sets COMBAT apart from the rest of the protein formulas out there? Well, aside from COMBAT's incredible protein matrix...its easy mixability...its fantastic taste...and the added BCAA's, glutamine and digestive complex, what really makes COMBAT special is the fact that OMEGA WAVE technology was utilized to "precision formulate" the product (as well as the entire Muscle Pharm line) to be the most effective of its kind. OMEGA WAVE technology is used to monitor the function of multiple biological systems and provide a comprehensive picture of changes in athletes, as they respond to training, life choices, and emotional stress, diets and supplementation. 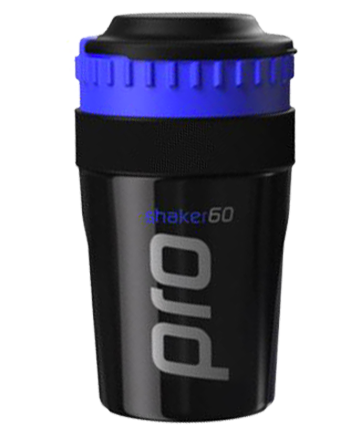 No other supplement company uses such advanced technology when designing their products. Mix 1-2 scoops 250-350ml of cold water. Vary the amount of water to achieve your desired consistency and taste. Consume 2-3 times per day for optimal muscle growth.